So, before you start thinking about ways to become debt free, you need to understand how and why you got there in the first place. Getting into debt because of unemployment or paying for unexpected emergencies is out of our control. But most of the time, we get into debt because of bad spending habits that you need to identify and eliminate in order to make a real change. If you are carrying a balance on your credit card, it’s costing you money (sometimes more than what you originally consumed) to spend money. When you want something really bad that you can’t afford, you rationalize the expense by looking at it in $20 monthly payments that are easily manageable. But what you don’t see (or conveniently overlook) is the $583 you incur in interest charges by only paying the required minimum payment. At $20 per month, it will take you seven years to pay off the new $1,000 item at the average 2013 interest rate of 14.7 percent, according to creditcards.com. Not to mention all the stress being in debt causes you. If you take all these factors into consideration next time you are about to swipe your credit card, the item you are about to splurge on may not seem worth it after all. But, what about impulse purchases? I’ve seen all types of tricks to control impulse charges, there’s the cut-them-in-half trick, the old freeze-it-in-a-block-of-water trick, or just call and cancel them all. But cancelling your credit cards could hurt your credit score because part of that score is a ratio of your available credit to your outstanding debt. And you can always call your financial institution and get your credit card number to make that impulse purchase online. Why do we have to resort to such extreme measures? Aren’t we intelligent enough to make informed decisions? It’s really not that hard. Take some time to examine your credit card statement every month and keep an eye on your interest rates. Pull out your phone’s calculator and quickly crunch some numbers before swiping. Be realistic when calculating and if you are not sure, use a credit card repayment calculator to have more accurate information. 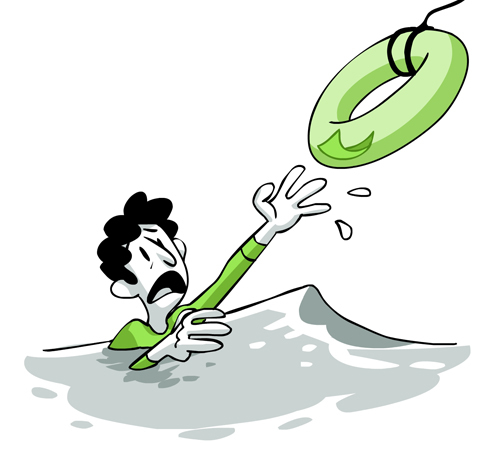 I know, making smart decisions going forward will keep your head above water but it still doesn’t solve the problem of being unable to get rid of your accumulated debt. There’s no secret recipe. This is what worked for me and it contains the same ingredients listed everywhere else. The usual. Get a full picture of all your debt. Start paying the most you can on the cards or loans with the higher rates while paying the minimum payment on the rest. Once you finish paying those, move on to the second highest rates, and so on and so forth. And as much as we love to see a growing savings account, there is no point on keeping your money in a savings account earning less than 1 percent APY when you are paying 14 percent APR on your credit card. Use that money to make additional payments toward your debt, once you are done you will be able to save even more.